In 1937, President Franklin D. Roosevelt began to prepare the United States for war, and on May 17th, 1938 US Congress passed the Naval Expansion Act, dedicating 1 billion dollars to enlarge the US Navy. The Naval board then built 25 new bases in the US and overseas. 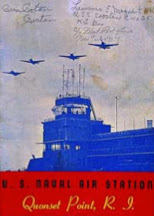 Included in this list of new air bases, was the shore-based aviation facility at Quonset Point Rhode Island. Construction commenced at Quonset Point on July 16th, 1940, with the project being awarded to two organizations on contract - the George A. Fuller and Company (one of the largest construction companies in North America at the time) and the Meritt-Chapman and Scott Corporation (a merger organization of three small salvage operations). During March of 1941, the Allies entered financial crisis. By June, England would no longer be able to purchase US arms and supplies. Due to the Neutrality Act of 1939, the US could not release arms to any warring country (such was Britain at the time) unless under “cash and carry” terms. 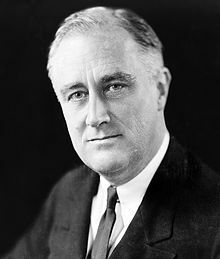 Seeing the necessity to sustain US allies, President Roosevelt's Lend Lease Act was passed by Congress on March 11, which allowed the US to “sell, transfer title to, lend, lease or otherwise dispose of [articles of defense to] the government of any country whose defense the President deems vital to the defense of the United States”. In response, Britain transferred ownership of properties at Gareloch and Stanraer, in Scotland, and Londonderry and Enniskillen, in Northern Ireland, to be used by the US as Forward Operating Bases (FOBs). As labour and material resources were quickly being drained by the war effort, the US military had to quickly supply buildings to house their troops. Around the same time, George A. Fuller and Co. and Meritt-Chapman and Scott Corp. were just completing the Quonset Point base. The Navy then extended their contract with George A. Fuller and Co. in order for them to develop and mass-produce a new prefabricated hut system to shelter troops abroad that would be portable, quickly and easily assembled and dissembled, adaptable to any climate and geography, and provide the highest possible level of comfort and protection. Quonset Point was selected as the assembly port for all supplies and materials required for the construction of these bases, and the actual factory production work was to take place on 85 acres of land purchased in West Davisville. A railroad spur linked these two sites, and this allowed raw materials to arrive at the factory site (not interrupting the base activities), and then the completed units were shipped by rail to the pier, and via barge overseas. The Temporary Aviation Facilities (TAF) project, now estimated at $20.5 million, was officially set in motion, with the first shipment of huts and supplies to be ready by June 1. While the factory was being completed, George A. Fuller and Co. began working on the hut design. The only licensed architect on the team, Otto Brandenberger, was selected to be the project manager. A final set of construction drawings was submitted by Brandenberger’s team on May 15, 1941. On June 11, 1941, a total of 450,000 cubic yards of materials and supplies, worth approximately $1.2 million, was prepared for loading. In less than one month, George A. Fuller and Co. had created a fully operational, mass-production facility generating huts on a scale that represented an annual output of $22 million per year. 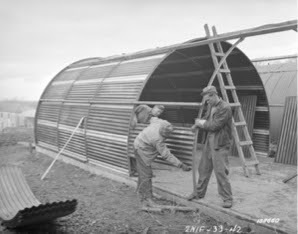 All of this was up and running, long before the US officially entered WWII on January 8, 1942, and at the war's end, an estimated 150 000 Quonset Huts had been built throughout the United States, and around the world. Wikipedia, s.v. "FDR," accessed December 5, 2012. http://en.wikipedia.org/wiki/File:FDR_in_1933.jpg. It is great to see that Pakistan is developing gradually. There are other states who are also doing great in navy bases. Other is given in this us naval bases by state website.